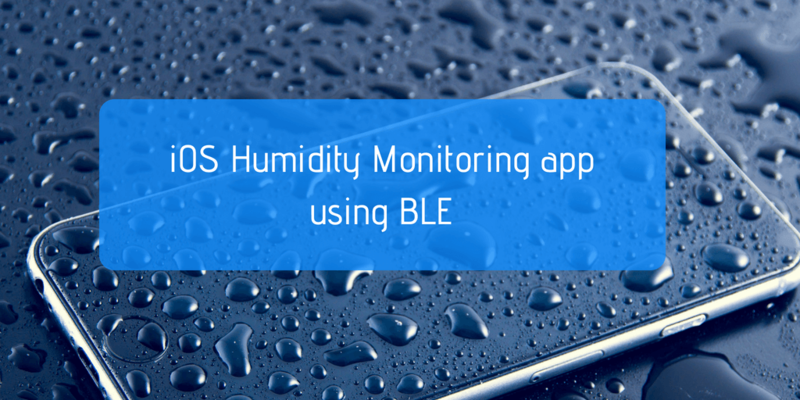 Learn how to design a humidity monitoring iOS app for warehouses in this tutorial by Madhur Bhargava, the author of IoT Projects with Bluetooth Low Energy. Which problem does the system address? How do the various individual parts in the system communicate with each other? This article will only elaborate on the essential parts and show you how to design the bare minimum system of the monitoring iOS app so that you can get an idea of the data flow and overall system design. Apart from several other items, warehouses are also used for storing vegetables, food, and medicines. Specifically for these items, it’s crucial to maintain a correct balance of the temperature and humidity; otherwise, there is a risk of major losses. Hence, a warehouse deploys specially designed monitoring systems, which continuously monitor the climate inside a warehouse. If anything goes awry, then these systems are capable of raising alarms as well as indicating it to the remote monitoring team. The remote monitoring team can immediately summon on site and put a cap on the situation at hand. To solve the problem stated earlier, one of the solutions is to strategically plant BLE Temperature and Humidity Sensors across the warehouse. They can then record the climate data and keep sending it to a central hub device capable of communicating over both BLE + WiFi Hub. The WiFi Hub is then responsible for connecting to a local Router, which can finally enable the data upload to the Remote Cloud and Monitoring Station periodically. With the periodic data now in their hands, the remote monitoring team can efficiently monitor them and make crucial decisions on the fly. This design even enables large warehouses to operate on a skeletal crew of 1-2 personnel. Just try to imagine what it would take to monitor the various crucial climatic parameters if such a solution was not in place. The basic idea behind the setup is based on the system design discussed above. The iOS app behaves as the BLE + Wi-Fi Hub, reading data directly from the sensors planted on store/warehouse shelves, and uploads it to the backend (Firebase) for monitoring purposes. Start by creating a single view project in XCode by the name of iOSWarehouseMonitor. The CBCentralManager objects (provided by the CoreBluetooth framework in iOS) are used to manage discovered and connected peripheral (CBPeripheral) objects. To read more about CBCentralManager, visit https://developer.apple.com/reference/corebluetooth/cbcentralmanager. The CBCentralManager object has a state and, as soon as you initialize it, its state gets updated. You can receive these state changes and updates in the centralManagerDidUpdateState method of CBCentralManagerDelegate. If you run the app now, then you should be able to successfully connect to a SensorTag if there is at least one broadcasting device nearby. In the preceding code, filter out the Humidity Service and place a characteristic discovery request for the same. In the above code necessary action is taken depending on the characteristicdiscovered. 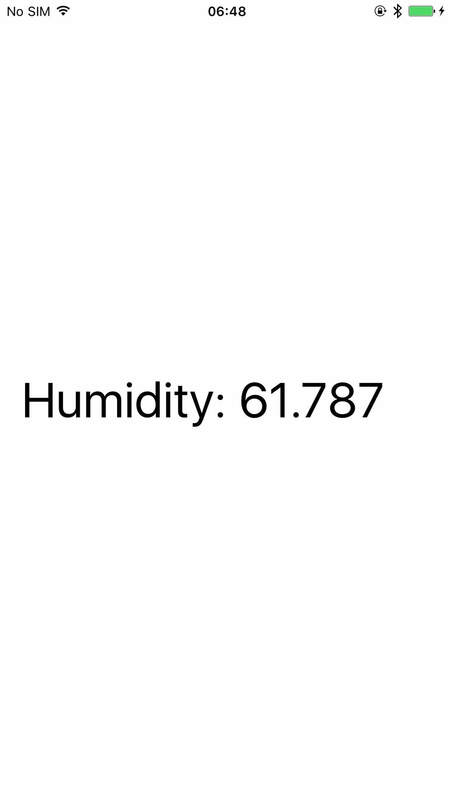 If the the Humidity Data characteristic is discovered, then enable notifications on the same. On the other hand, if it is the Configuration characteristic, then enable the Humidity Sensor from Sleep to Active mode. Parse the received data and update it on the UI label. If you are able to see the humidity values getting updated dynamically on the screen as shown above, then congratulations! You have successfully read the Humidity Data from the SensorTag. Find the code for iOSWarehouseMonitor at the following link: https://github.com/madhurbhargava/iOSWarehouseMonitor. If you enjoyed this tutorial and want to build your own IoT projects with BLE, you can explore the book, IoT Projects with Bluetooth Low Energy, by Madhur Bhargava. The book is a complete technical reference guide to designing applications with Bluetooth Low Energy, and all the applications/projects described in the book serve as a guide to designing BLE-based solutions for real-world scenarios. This post was written by a guest contributor. You can see their details in the post above. If you'd like to write a guest post for SwA, then check out our Write for SwA page for details. We'd love to share your tips with our readers.